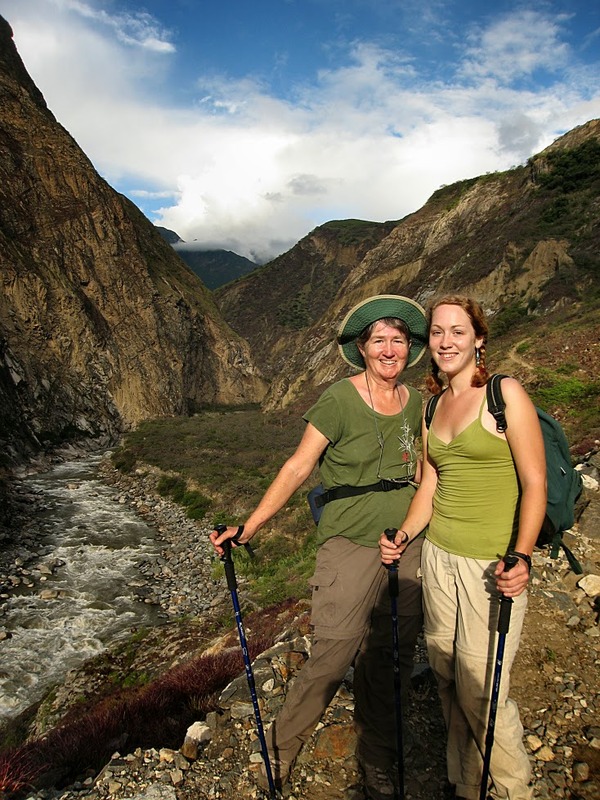 Cathleen's Hands: Choquequirao Part III: Down and Up—Again! Choquequirao Part III: Down and Up—Again! It rained most of the night and we awoke to a cloudy-foggy morning. When we looked out our tents, the clouds moved slowly below us and it looked like we were in heaven. We were able to sleep until 6:00 am because the altitude meant that the day would be cool—at least at first, until we slipped down to the river later in the afternoon. We could start hiking as late as 7:00! Although the trail was muddy from the rain, it was not slippery and it was easy to walk back down to Marampata where Rebecca and I drank some more yogurt and restocked our chocolate supply for the day. Then it was down, down, down again. The rocks slipped against each other in the trail making it harder to go down than to go up in many places. By the time we reached our lunch stop at Santa Rosa, my knees were mushy and we still 1700 feet to descend and then 1200 back up the other side of the canyon to our campsite. Fortunately, Samm, our guide, was very patient with my slowness and walked along with me carrying on a lighthearted conversation. He was fascinated with my tales of the wonders of the desert Southwest US and I encouraged him to go there someday to see them for himself. 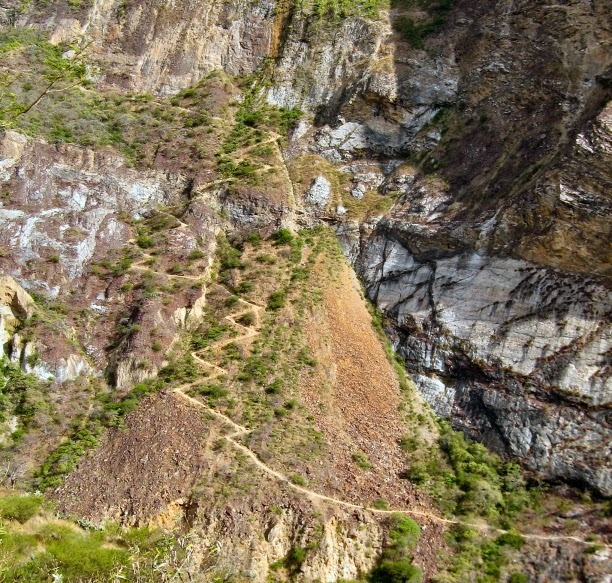 to have to traverse on the other side of the canyon. (almost literally!). I did not fall once while hiking in Peru! We got another chance to ride the cable car across the river before beginning the ascent. We only had to walk another hour uphill before we found our resting place. The caretakers at the Chaquiska campsite had hens and chicks outside and a bunch of cuy (guinea pigs which they raise to eat) running around the floor of their kitchen. Santiago prepared another dinner which we ate with relish—we had burnt a lot of calories today! Again, it rained through the night, but by the next day, it was only cloudy and foggy again. We never had to hike in the rain—how nice of our guide to arrange that. We rose by 4:30 am again on the last day, but an early start was not so necessary since the day was cool. 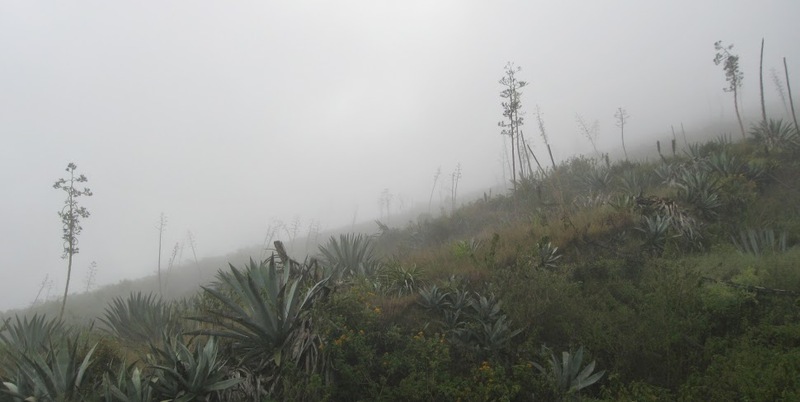 The fog lent a surreal effect on the desert vegetation. However, the hike up seemed to get longer as we got closer to the finish. The last 15–20 switchbacks seemed interminable. I was stubbornly refusing to ride the horse and I made it to the top on my own—worn out but thrilled at the accomplishment. Our trekking group: Me, Rebecca, Anca, Ariel, and our guide, Samm.